Dull bronze color. Aromas of white balsamic vinaigrette on lettuces with sourdough croutons and dried apple with a supple, lively, effervescent, sweet-and-sour medium-to-full body and a tingling, delightful, medium-length honeyed mulberries and quince and starfruit finish. A mellow sour ale with a very traditional style and effortless drinkability. Bottom Line: A mellow sour ale with a very traditional style and effortless drinkability. Flanders style red ales are deep red to reddish-brown in color and range in alcohol from 5-6.5%. These beers are defined by a complex fruitiness ranging from cherries to apples to oranges and a bracing acidic sourness. This defining sourness is a result of having been aged for years in well-used large wooden tuns allowing bacterial interaction with the beer and imparting a sharp ’sour’ character. Hops do not play much of a role in the overall flavor profile of these beers. Similar to Flanders style brown ales, these beers are a result of careful blending of aged beers to achieve the desired flavor profile. Noteworthy examples of this style include: Duchesse de Bourgogne, Rodenbach and Cuvée des Jacobins Rouge. 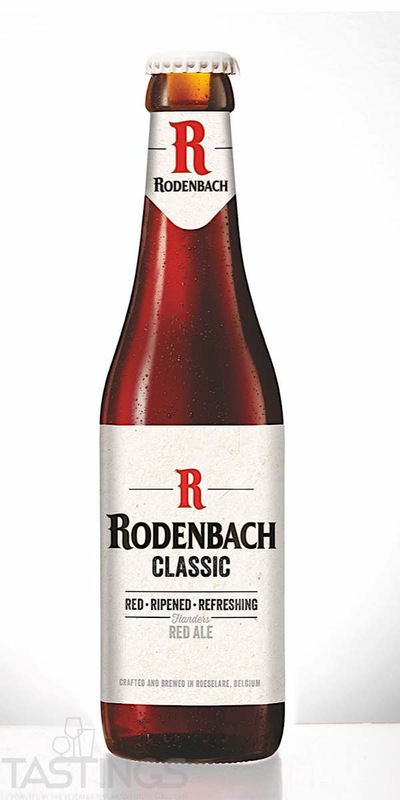 Rodenbach Brewery Rodenbach Classic rating was calculated by tastings.com to be 90 points out of 100 on 6/13/2018. Please note that MSRP may have changed since the date of our review.